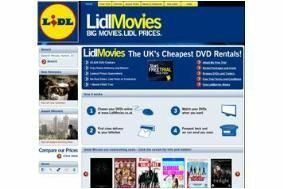 HOT DEAL: Free one month trial of Lidl's new film rental service | What Hi-Fi? And if you decide to continue using the service after that, Lidl says its prices are 15 per cent cheaper than Lovefilm, starting from £3.32 a month. For example, Lidl charges £3.32/month for two films (Lovefilm £3.91/Blockbuster £4.88), £4.99 for three discs per month and £6.65 for four discs a month (Lovefilm and Blockbuster both charge £7.82 for four). You can compare prices here. LidlMovies works in much the same way as Lovefilm. Once signed up, you can choose the films you want online at www.LidlMovies.co.uk and they'll be delivered by first class post to your home. You watch the films when you want, then use the Freepost envelope to send them back to Lidl before ordering some more. There's a good choice of films to choose from, including new releases such as Public Enemies, Night at the Museum 2, Monsters vs Aliens and Sunshine Cleaning. Or you can opt for back-catalogue titles such as Slumdog Millionaire, Mamma Mia!, Gran Turino and Burn After Reading. Full details on the LidlMovies website.